We think this is a juvenile bird, perhaps one of last year’s chicks, but it could also be a parent. 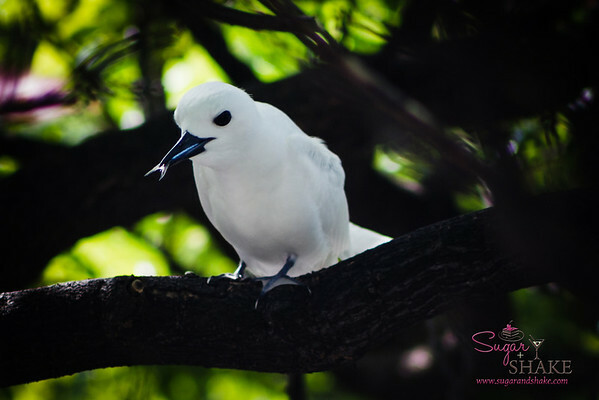 There are several Manu-o-Kū, or white fairy terns, that call the monkeypod tree behind our building home. The tree is right on eye-level with where I park my car, and one day, several years ago, we were surprised to see an adorable ball of fuzz perched on a branch. Long story short, each year sometime between March and May, the birds “nest,” each pair trying to hatch one little chick. I say “nest” because they don’t build them. They plop that egg down on a branch and sit on it for about a month. We feel like this habit is partially what has led to their “threatened” status. They don’t exactly pick the best places. Not all the pairs in our tree are successful, though if it’s early enough in the season, they’ll try again if the first egg doesn’t hatch. Once or twice, we’ve been lucky enough to have two chicks in a season. But more often than not, there’s just one chick out of the two or three breeding pairs that we’ll see zooming around. The parents take turns sitting on the egg (and, once it hatches, the chick), the non-sitter flying out to sea to hunt for fish, which they’ll bring back to feed their baby. If you want to know more about these birds, this is an excellent post with some fantastic photos—better than most of the ones I’ve taken. Next time you’re outside, take a look up—you may spot these elegant guys soaring in the sky, or a ridiculous little feathery fuzzball perched on a branch.